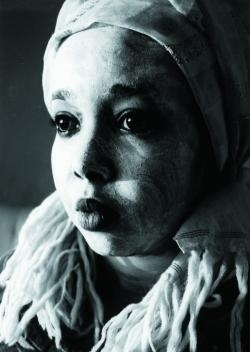 Fire Eyes is the voice of the wounded souls, communicating the anguish and the pain, of the harmful practice of Female Genital Mutilation/female circumcision in Africa, which has affected almost 80 million women in Africa, 135 million women around the world. The film maker had gone through this Rite of Passage when she was 13, and lived with the scar and trauma since then. This ancient custom is loosely based on concept of purity of family blood lines, but it primarily acts as a mechanism of patriarchal societies to control women's sexuality, life and freedom, driven by fear and ignorance. In parts of Africa, Middle East and Asia, this artificial/puritanical form of chastity is still prevalent where the communities follow this tradition and the girls and women live with feelings of oppression, violence and stigma. The film presents parallels among various developed and undeveloped cultures across the globe, where women's livelihood and freedom is suppressed. Clarke Foundation, Rovi. "Fire Eyes: Female Circumcision (1994)." Rev. of Fire Eyes. The New York Times 1994: n. pag. Www.nytimes.com. New York Times. Web. 04 Dec. 2014. Flimakers Library. "Fire Eyes: Female Circumcision." Academic Video Store. Filmakers Library, 1995. Web. 04 Dec. 2014. Schulman, Catherine. "Sundance Institute." Fire Eyes. Sundance Insitute, 1994. Web. 04 Dec. 2014. This film was shown at the 1994 Sundance Film Festival.